It's never good to go down 1-0, but Arsenal's response against Stoke City at the weekend was something we didn't really see much of last year. The penalty, borderline as it was (my official stance was "I can see why it was given, but it shouldn't have been given,") seemed to wake the Gunners up, and with the match even by halftime, it was almost like hitting the reset button. Arsenal have not trailed at halftime in any league fixture this season, which is quite a statement with 15 matches completed. 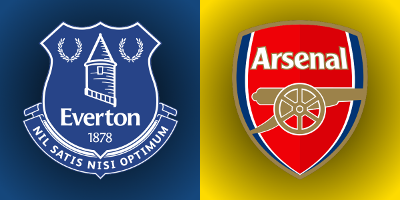 We're in the middle of three matches in eight days as Arsenal head up north to Goodison Park to face an Everton side that have struggled since a great start, but still have not lost a home match all season. Arsenal have, historically, done well against Everton, even moreso in Liverpool than at home, but this will not be an easy fixture. The Toffees' dip in form belies the fact that they have a number of threatening offensive options, even with a few injuries in their midfield. Still, if Arsenal want to keep pace with a Chelsea side that is clicking well right now, they cannot afford to drop points. 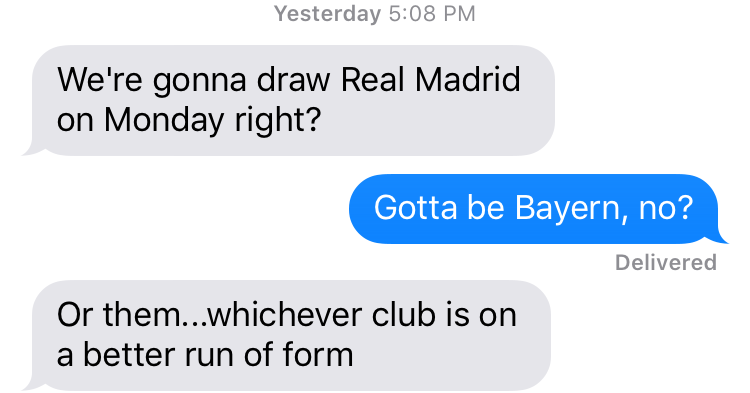 Also, LOL Bayern, of course. You know what they say, "God doesn't bring a defender back from injury without taking another one." I mean, I think they say that. I don't know who "they" are, though. But those who say that are right, because no sooner was Hector Bellerín back on Arsenal's bench than Shkodran Mustafi picked up a hamstring injury and is expecting to miss three weeks. Mustafi has been such a rock in defense since joining the club that I still haven't learned how to spell his first name. I haven't gotten it right yet because I never need to talk about him in this section! The good news is that Gabriel has had a run of games at right back, thanks to that aforementioned injury to Bellerín, so he's not going to be coming in cold. Aaron Ramsey remains out with a "slight" hamstring problem, which is a little worrying because he, like Jack Wilshere, is the kind of player where you here "slight problem" and then he's out for months. In any case, Ramsey's still not back, so I wonder if we'll see some rotation in midfield here. Speaking to that rotation, I've guessed the XI fairly conservatively; aside from the substitution due to Mustafi's injury, the only switch I made was to bring in Mohamed Elneny for Granit Xhaka, as Xhaka would be in the most need of rest, after Francis Coquelin sat out the trip to Basel last week through suspension. Alex Iwobi could get a run out on the wing as well; perhaps Alexis Sánchez will get another rest, though he looked pretty pissed off when he was substituted on Saturday. Predicted XI: Čech, Bellerín, Gabriel, Koscielny, Monreal, Coquelin, Elneny, Walcott, Oxlade-Chamberlain, Özil, Alexis. Yannick Bolasie, purchased for 80 billion quatloos from Crystal Palace this summer (fine, £25 million,) is now out for the season and perhaps longer after tearing his ACL against Manchester United. There are fears that the damage is not just to the ligament and that the Congolese winger could miss more than nine months. Midfielder Muhamed Bešić is targeting a return in February from his own ACL tear, which he suffered in Wayne Rooney's testimonial. 22-year-old defender Matthew Pennington has not yet featured this season and is currently working his way back from a hamstring injury. Arouna Koné's season has been marred by a number of injuries; he hasn't featured since a League Cup tie in September, so he remains a doubt through a lack of match fitness. Even without Bolasie and Koné, Everton have a number of options in midfield, including Aaron Lennon, Kevin Mirallas, Ross Barkley, Gerard Deulofeu, Enner Valencia, James McCarthy, and Tom Cleverley, all of whom could line up behind Romelu Lukaku. Predicted XI: Stekelenburg, Coleman, Funes Mori, Williams, Baines, Barry, Gueye, Lennon, Mirallas, Barkley, Lukaku. Since dropping their League Cup tie to Southampton, Arsenal have returned to winning ways, instead of the drawing ways they had been going through prior to that cup exit. The Gunners have won three straight (two in the league and once in Europe) since the home loss to the Saints and are now unbeaten in 14 Premier League fixtures. As other clubs start to drop points around them, Arsenal have consolidated their place in second in the table, still three points back of a Chelsea side that has now won nine on the bounce. Here's to hoping they drop some points between now and their meeting with Arsenal at Stamford Bridge on the first weekend of February. The record winning streak, by the way, is 14 and it's held by Arsenal. As for Everton, they have cooled significantly since their hot start to the season. After going unbeaten through the first five league games, the Toffees have won just once in their last 10. Since beating West Ham on October 30, Everton are winless in five, but have drawn their home games and lost their road games. They've tumbled from second place to ninth, but they have also not yet lost at home this season, drawing four and winning three. In this corresponding fixture last season, Danny Welbeck put Arsenal ahead 1-0 on seven minutes and Alex Iwobi's first for the club made it 2-0 just before halftime. The win for Arsenal snapped a three-match winless run in the league, while also coming in the days following twin cup exists, to Watford in the FA Cup and Barcelona in Europe. Arsenal have more wins against Everton in league play (93) than any other club. The referee is County Durham-based Mark Clattenburg. Arsenal have struggled with Clattenburg over the last two seasons, including their 1-1 draw with Tottenham last month, but they have historically done well with Clatts in the past and have a strong record with Clattenburg against Everton specifically. In fact, Clattenburg was in charge of this fixture last year, the aforementioned 2-0 Arsenal win. He also worked Arsenal's FA Cup win over the Toffees in 2014, en route to their first silverware in nine years. Clattenburg worked Arsenal losses against West Brom and Chelsea last season and has worked two Arsenal draws this year: 0-0 against Leicester in which he denied the Foxes a late penalty, and 1-1 against Spurs, in which he gave Tottenham a borderline penalty. In fact, that was the first time Clattenburg has ever given a penalty against Arsenal. This is Clattenburg's first Everton match of the season; the Toffees have not seen him since he worked this fixture last year. John Painting is a contributing writer to the Modern Gooner and a pirate radio station. You can follow him on Twitter @zorrocat for good tunes and pirate jokes.